I like kelp. I have fond beachy childhood memories of family trips spent car-camping on the beaches that are now, but not back then in the 70’s a National Park. Running and riding my bike on hard damp sand after the tide receded leaving our beleaguered Volkswagon campervan tired from the struggles of too many mountains on the potholed and washboard textured roads to the Pacific coast was now half sunk in the sand as my dad did not read the tide table correctly. In those days, one could park on the3 beach and camp and oddly enough the very spot we preferred to park is now a paved parking lot. Herds of beach folk, squatters mainly who inhabited the alder and scrub lined barrier between highway and surf came to attempt the excavation and pushing of the van before the next high tide. Great fun for a 10-year-old getting his first hints of the sea air that would draw me back and back so many more times to paddle these same shores. 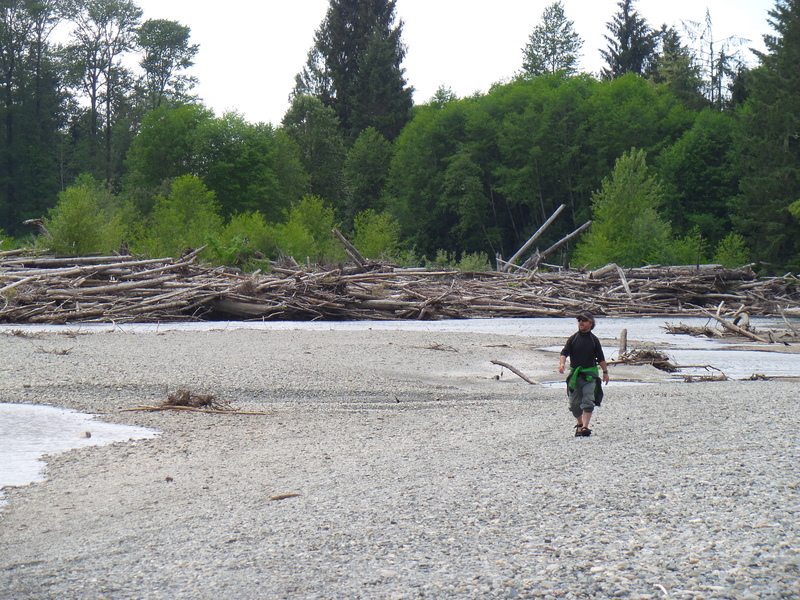 Making ramps with beach wood to leap my bike over tangled gnarls of these twisted sea weed cords as the crowd gathered and a party began, and warm beers were drunk as now it was a clear job for the only tow truck in town. Some of the bundles of kelp spread out with loose tendrils reaching towards the sea. 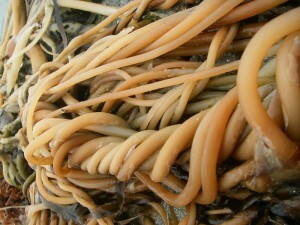 All manner of debris collected in the tangles as the tide rose and fell, tumbling them like unraveling logs on the sand. Some heavy and immovable stayed on the beach while other smaller rafts were pulled back to the ocean. 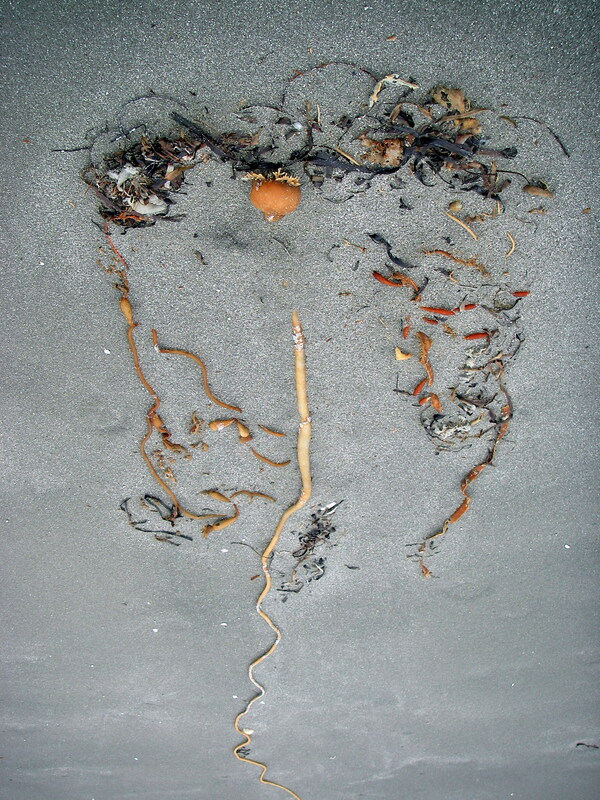 A kelp angel in the sands of Clayoquot Sound. For me, these bundles were natures puzzles. To pull a single length successfully from the mesh was nearly impossible. I would then turn to a lone length washed up. The starter of a kelp bundle waiting patiently for others to curl and hug and cuddle with it. These slender kelp tails worked well as bull whips, and I would be found swatting anything that moved. Lines of cans on a log, imaginary enemies and I am sure my baby sister has tales to tell about me chasing her around with the stuff. A walk on just about any beach will result in a kelp find. I have photographed the best of these messy tangles and am enthralled by them. On the water, these great rafts can be a tremendous obstacle. I have paddled, poked and prodded my kayak through large rafts of kelp. Oft times my kayak resting up on them as I struggled to pike pole my way across and seeking out any gaps big enough to get at least one good swish with the blade. Coastal kelp is far larger than the puny gardens or lone stragglers bobbing about in my home waters of the Gulf Islands. Out there on the wild coast it thrives, and as much as it can be problematic for kayak navigation, this is a good thing. Kelp gardens breed life. There is a fine balance between us and nature and occasional tipping of the scales by interfering with the natural balance such as the decimation of the sea otter population on the coast of Vancouver Island driving them close to extinction. This caused the environment to drastically change. Without the sea otter diving to the sea bottom and snatching up tasty urchins, the urchins took over, as did namy other species of shellfish. The shellfish over population aided to the removal of the kelp. They destroyed it and in doing so removed the homes of many other species. The scales so tipped so far that a new industry formed all along the coast and into Washington State. Shellfish became the latest harvest replacing the otters and claimed itself a tradition. In 1969, a mere 89 otters were relocated from waters in Alaska to Kyoquot and the Bunsby Islands just south of the Brooks Peninsula on Vancouver Island. They have been moving southwards and colonizing. I had the lovely opportunity to glide my kayak quietly into one such colony near Nootka Island. Since 1969, that small group has grown to over 3,000 individuals. Astonishingly good results. However this has caused a problem. Sea otters eat shellfish. Good for the health of the kelp forests and all that live in them, as well as good for the otter as in his absence the growth of urchins has made a smorgesbord for them. The problem has come from some grumbing from the shellfish industry people who claim the reintroduction of the urchin-eaters is causing a downfall in their catch. The cute little otters are going to destroy them! I seriously doubt this. For some years this industry has grown only due to the fact it had no competition for the resource. But I hardly think 3,000 otters could result in the ending of an industry. As an ending note, I at the tender age of 48 picked up a long healthy length of kelp on McKenzie Beach near Tofino last year and in an attempt to use it as a whip, I most efficiently swatted myself in the face with its tip. Thanks sea otters! A friend today reminded me that change, or the prospect of change either on our life course, or more internally can be scary. This fear of changing ourselves through a chosen experience is one we all face on some level. Her imminent departure on a trek so many before her have done and word that it had changed them drove that fear home. She claimed that she was comfortable in who she is, and not wanting anything to alter that state of mind and being. Understandable to any of us who have faced the prospect of a life-changing experience. In this case, a pre-planned version of those unlike the ones thrust upon us as the sudden death of a loved one, or the loss of a job you have held for years. New paths are what we live for, and to grow is our truest greatest inner need. Change is not always easy, or good, or even bad. It just is. It is easy to look at what we fear the most in the eye, that being the unknown or the unseen future and flinch for a moment of extreme hesitation. But to not go forward, to not put boot to trail head or paddle to water, to avoid life for fear an event may change who we are is to stagnate and do our soul the unfortunate disservice of experiential neglect. To that, I put some thought to all of the above and looking back upon my own experiences, relationships and journeys and realized that they all came with that hesitation. Where any of them life-changing? Path altering perhaps, and one or two might have left a mark and lessons to be examined. Did any of them change who I am as a person? Maybe, but only in the subtlest of manner. We are who we are, and I look at them carefully and try to cherry pick the positives and seeing clearly that at no time has stepping outside of myself ever really been a negative. That needing to turn back, to avoid, to not go, to find numerous excuses why I should stay dwelling in my fortress of comforts have all slapped me in the face at one time or another. To stay means only after the event had come and gone without me in it that I would have learned nothing from staying comfortably me. I let those life experiences, adventures in the outdoors being the pinnacle of those unknown fearful mornings at the beginnings of a treks, trips or paddles pass under my feet. They happened and the courage I needed to face the unknowns I found flowing freely within my spirit, but only in the time after the experience had passed. Then, and only then did they form from the future of wondering and anxiety to the recent past and become fond memory. 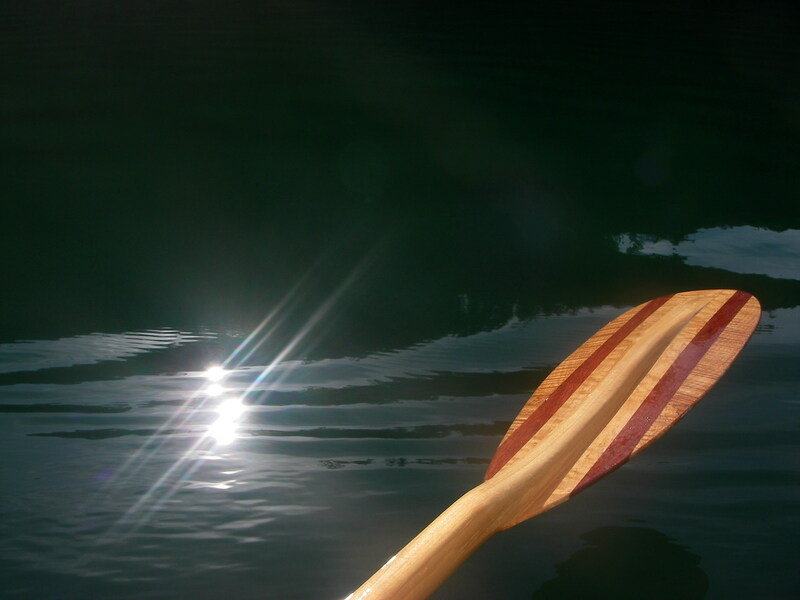 As a kayaker, I have faced many scary moments. I seem to add continually to my list of knees-shaking against the inside of my kayak experiences. Each one finding me without compromise, and forcing me to ask if the fond memory will be worth it. To that nameless fear, and to that hesitation at something possibly changing me forever I hope the answer will always be a soundly loud, yes. I had not realized to what extent that sound meant to me, what depth and part of my being it reflected, and how familiar the sensation even after a long absence from floating in my kayak. That first full paddle stroke to the chilly March waters. That splosh, and that spatter of sea water droplets falling from the blade’s edge as the opposite blade bathes as well for the first time in over six months. Life and other things managed to divide me from the seat of my kayak for months now but that thread is broken, and the return to my prior self is in progress. I had big plans for this coming year. I was going to challenge myself, my body, my mind and my imagination in such ways by attempting things in my kayak that are far bigger than myself. Scary, but wonderful things such as entering the Yukon River Quest. Maybe next year…yes! With such distances to travel to get ready for that race of over 700 kilometers from Whitehorse to the gold mining town of old, Dawson City attempting this feat this year would be foolish. I am turning 50, a flabby mess with a head full of flooble from a rather stressful year before. Time to get fit, time to remember who I am, and get my head back into the game of paddling.